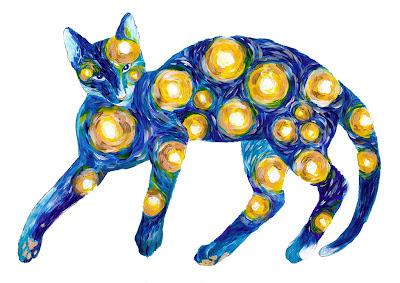 Artist Rag Aragno created Starry Cat, inspired by The Starry Night by Vincent van Gogh. I love all of the fine details in this painting, right down to the kitty's sweet yellow paw pads! That is one special cat, that is for sure. Hope you win your category. Take care. I think I'm gonna make that my desktop. I love the starry cat. I recognized it right away.